Will the new EAS event codes be used in every coastal state and territory of the United States? Will the new Storm Surge Watch/Warning apply to winter storms? Will NWS use of the Coastal Flood Watches/Warnings continue? What's the difference between a Coastal Flood Watch/Warning and the Storm Surge Watch/Warning? Will the new Extreme Wind Warning now apply to derechos or to mountain peaks and valleys? What's the difference between the Extreme Wind Warning and the existing High Wind Warning? What equipment changes are necessary for EAS participants to process the new event codes? 1. Will the new EAS event codes be used in every coastal state and territory of the United States? Not at first. Once operational, the new Storm Surge Watches and Warnings will only be issued in association with potential and ongoing tropical cyclones (i.e., hurricanes, tropical storms, and tropical depressions), subtropical cyclones, and post-tropical cyclones affecting the Atlantic and Gulf coasts of the continental United States. Storm Surge Watch and Warning services will expand to additional states and territories in the future. The Extreme Wind Warning will only be issued in association with hurricanes affecting the Atlantic and Gulf coasts of the continental United States, or Puerto Rico and the U.S. Virgin Islands. The issuance of Extreme Wind Warnings beyond these areas is not anticipated for the foreseeable future. A map of the areas where an Extreme Wind Warning can be issued is provided below. While the EAS codes for the Storm Surge Watch and Warning and Extreme Wind Warning have been approved for use by the Federal Communications Commission, each coastal state or territory will update its own respective EAS plan; the operational implementation of the EAS codes will occur only after necessary coordination between State Emergency Communications Committees and State Broadcaster Associations. It's possible some states or territories might not implement the new codes in time for the 2017 hurricane season. 2. Will the new Storm Surge Watch/Warning apply to winter storms? Not for the foreseeable future. Once operational, the new Storm Surge Watches and Warnings will only be issued for life-threatening storm surge events associated with potential and ongoing tropical cyclones (i.e., hurricanes, tropical storms, and tropical depressions), subtropical cyclones, and post-tropical cyclones affecting the Atlantic and Gulf Coasts of the continental United States. It is possible the Storm Surge Watch and Warning products may be used for other coastal flooding events, such as winter storms, sometime in the future. If this change were to occur, ample notice would be provided to the public. 3. Will NWS use of the Coastal Flood Watches/Warnings continue? Yes. Coastal Flood Watches, Warnings, and Advisories will continue to be issued for flooding of coastal areas associated with storms that are not tropical cyclones (i.e., hurricanes, tropical storms, and tropical depression), subtropical cyclones, or post-tropical cyclones. Most frequently, they will be issued for winter storms, unusually high tides, or prolonged periods of strong onshore winds that have pushed water into places it does not normally go. In addition, Coastal Flood Advisories may be issued in areas adjacent to a Storm Surge Watch or Warning to alert for potentially dangerous coastal flooding that is below the threshold established by the National Weather Service for life-threatening inundation. 4. What's the difference between a Coastal Flood Watch/Warning and the Storm Surge Watch/Warning? Storm Surge Watches and/or Warnings will only be issued along the Atlantic and Gulf Coasts of the continental United States during potential or ongoing tropical cyclone (i.e., hurricane, tropical storm, and tropical depression), subtropical cyclone, or post-tropical cyclone events for areas that have the potential for life-threatening coastal inundation. Coastal Flood Watches, Warnings, and Advisories are used for alerting the public for all other coastal flooding events. For example, Coastal Flood Watches and/or Warnings may be issued for unusually high tides or a situation where there are persistent onshore winds that have pushed water into places it does not normally go. Coastal Flood Advisories are issued for coastal flooding that is not expected to be life-threatening. Coastal Flood Advisories can be issued in areas adjacent to a Storm Surge Watch or Warning. There will not be a "Storm Surge Advisory", as the National Weather Service has categorized "storm surge" as life-threatening, requiring a Watch and/or Warning. Storm Surge Watches and Warnings will be issued much less frequently than Coastal Flood Watch/Warning/Advisories, as the Coastal Flood products cover a larger range of coastal flooding from a variety of sources. 5. 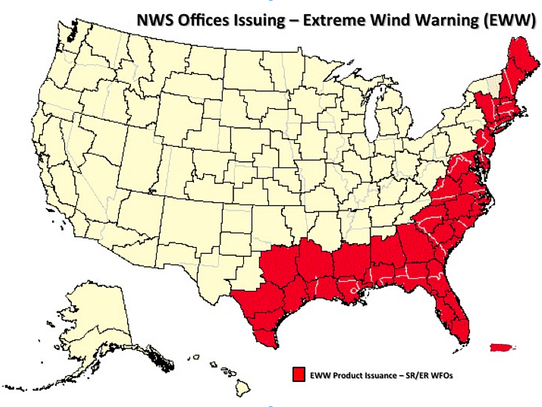 Will the new Extreme Wind Warning now apply to derechos or to mountain peaks and valleys? The Extreme Wind Warning is only issued to warn for sustained surface winds of 115 mph or greater in association with major hurricanes (category 3 or higher on the Saffir-Simpson Hurricane Wind Scale). If there were a mountainous area affected by a major hurricane that had the potential for 115 mph or greater sustained surface winds, then it could apply to mountain peaks and valleys. The Extreme Wind Warning will not apply to derechos. 6. What's the difference between the Extreme Wind Warning and the existing High Wind Warning? The Extreme Wind Warning is only issued in association with major hurricanes. The criteria for an Extreme Wind Warning is sustained surface winds of 115 mph or greater while the High Wind Warning criteria is 40 mph or greater. The Extreme Wind Warning is intended to alert the public to prepare for potentially life-threatening conditions. 7. What equipment changes are necessary for EAS participants to process the new event codes? Gorman-Redlich will deliver new units with the codes as per the deadline. For existing units, contact the company. A new EPROM is likely required. Monroe Electronics/Digital Alert System Users: DASDEC and R190 One-Net software version 3.0 already supports these three event codes. If you have v3.0, no further action is needed, aside from selecting the codes from the drop-down menu. Sage Alerting System Users: Sage plans to include the codes in the upcoming 89.30 release. Trilithic Users: EASyCAP B4020 software will be updated for the event codes. Users subscribed to the Trilithic Newsgroup will be notified when the update is available. There are no plans to update the EASyCast Platform; that platform has reached the end of its service, so unless a large number of users request an update, one will not be released. TFT: The manufacturer is no longer in business. The NWS Dissemination Systems Team will provide more information as it becomes available.